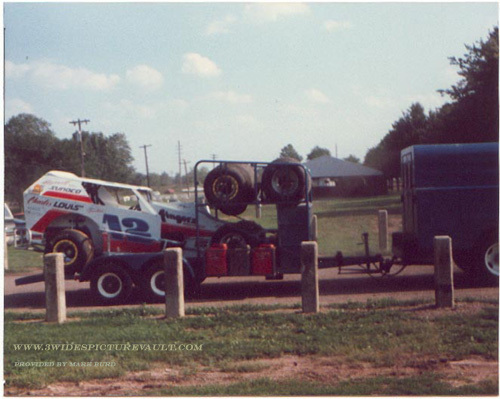 Comments: Jerry drove this sharp looking #12 that I'm pretty sure was owned by Kenny Onka out of the Millstone, NJ area. (I remember Butch Green running a very similar lightweight car at East Windsor in 1990 and 91. Butch's son is now a top running URC driver! 04/12/03 Todd L Yes, this car was owned by Kenny Onka (Onka's Charter Service) and Butch Green did run for the team as did former URC and current USAC competitor Tom Capie. 04/13/03 Todd J I can remember Jerry, Butch, Tom Capie and Richie Cass Sr in the Onka cars. I think at one point they were running two Onka cars. A wide body and the narrow one. Remember when Paul Richards (I think) came out with a chopped down Spotts 2s, similar to the 12 or how about Les Katona in his chopped down version with a roof wider then body... How about the time Capie escaped a buring #12 in turn 1-2.... ? 03/09/05 Billy Walker First I gotta say this is the greatest site ever, I have relived my childhood and youth over the past few hours. Now on to business. The car in the picture is indeed one of Kenny Onka's cars. The Flemington car, as we called it.It was a Burnett chassis with a T/K performance moter assembled by Kenny. Jerry Tommarchio(this is correct spelling) drove this car at Flemington, Nazareth,Middletown and Delaware. Tom Capie was the original driver of the Windsor Rocketship, until he and Kenny parted ways and Jerry took over both rides. The Windsor car was also one of John T.'s creations with a 311 CI smallblock on injectors. When the car was hooked up nobody could touch it, when it was bad it was VERY bad. Many nights I told Burnett and Onka we should cut it up for a boat anchor. 05/10/05 Vic Patti I have to agree with Billy Walker. The light weights were wicked fast when they were right but were the most evil things known to man when they decided to be bad. I owned the 02 light weight that Les Katona drove at E.W. and we did end up cutting it up and running the conventional modified for the rest of the year. The car weighed 1704 pounds with a dry sump and full load of fuel ready to hit the racetrack. There was also a lot of political stuff in the background as Tom O'Rourke who was calling the shots then at E.W. did not like the look of these cars and it was mostly on the strength of Kenny Onka's reputation that we were allowed to run. If our car had been banned Kenny's would have had to go to. A lot of phone calls and meetings before the whole issue died down. Then it seemed like thinking out of the box was a neat idea, now maybe because I am older, staying with the traditional seems like a better way to go.